Toptal supports developer communities all over the world and is proud to partner with Agile Portugal, the premier international conference in Portugal, about agile software development and its practices, technologies, attitudes, and experiences. Created with both experts and beginners in mind, Agile Portugal is the place where the Portuguese agile community comes together to exchange and share their experiences about agile development approaches. 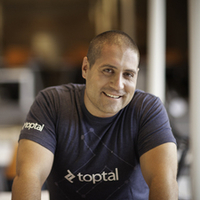 Predrag Gajić, Technical Sourcer at Toptal, will be at the event, so be sure to drop by and say hello. The event is a great opportunity to meet some core team members who are in town, learn more about Toptal, and meet the Portuguese agile community. For more information on the event, please see the event website or contact Predrag Gajić.